Diagram of a dental bridge and the supporting adjacent teeth. 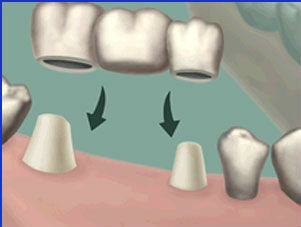 A dental bridge is a solution to replace one or more missing teeth. Unlike a denture which can be taken in or out, a bridge is cemented into place using the adjacent teeth as anchors. The diagram to the right shows how a bridge fits into your mouth. Bridges can replace one or multiple teeth. They can be supported by natural teeth or by dental implants. With the widespread adoption and success of dental implants, bridges are used less frequently today than in the past. The major drawback to bridges are the fact that the adjacent teeth are prepared for crowns in order to support the bridge. This is evident in the diagram. Nevertheless, there are still many important uses for bridges and many of our patients have ones that were made decades ago. Our patient to the left lost her upper right canine. After discussing all of her options with her, including dental implants, the patient and Dr. Nicholas Calcaterra decided to do a bridge. This decision was made in part because the two adjacent teeth already had large fillings in them. By doing a bridge, she would not only replace the missing tooth, but also significantly improve the appearance of the adjacent teeth. Dr. Calcaterra worked closely with her and the Connecticut based dental laboratory that he uses. A very esthetic porcelain material was selected to match the other crowns present (the other crowns are seen on the far right of the photo). Our patient was thrilled. We feel the results speak for themselves. Before and after photo of a Maryland bridge. Case and photos completed by Dr. Nicholas Calcaterra. The patient in the photo above is of a young adult male. He was congenitally missing his maxillary left lateral incisor. For multiple reasons, he was not a good candidate for dental implants. An all porcelain bridge was made for him that very accurately mimicked the coloring and shape of his adjacent teeth. The result was a tooth that looked like all of this other natural teeth! 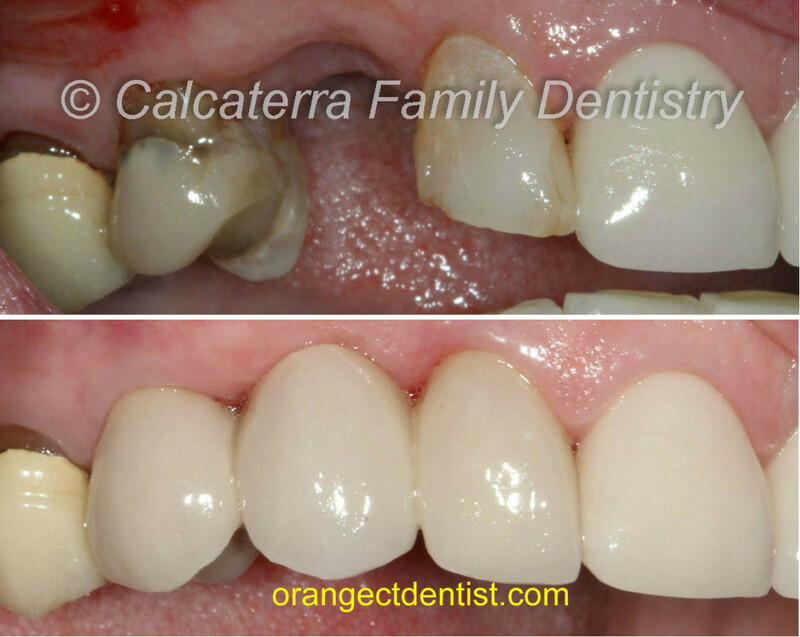 The entire case was completed in our office in Orange, CT by Dr. Nicholas Calcaterra. Insufficient bone to allow for successful placement of dental implants. Placement of implants is not possible due to proximity to important anatomical structures (sinus cavity, major arteries, major nerves, etc.). The space between the adjacent teeth is not wide enough to allow for an implant (see above photos). The patient does not wish to undergo surgery for implants. The patient has a specific medical condition that makes implant surgery less predictable or lowers the success rate. We have have helped hundreds of patients replace missing teeth with either bridges or dental implants. We will explain the pros and cons of each treatment approach to ensure that your unique needs are met. We strive for every case to look like the photos above! Call us at (203) 799 – 2929 or visit this page to request an appointment.